Furuno set a new standard for touch-screen technology when they introduced NavNet TZtouch2, the first multi-function display (MFD) to utilize edge-swipe technology. In February, they raised the bar on innovative navigation solutions with the introduction of a Black Box NavNet TZtouch2 system, the TZT2BB. 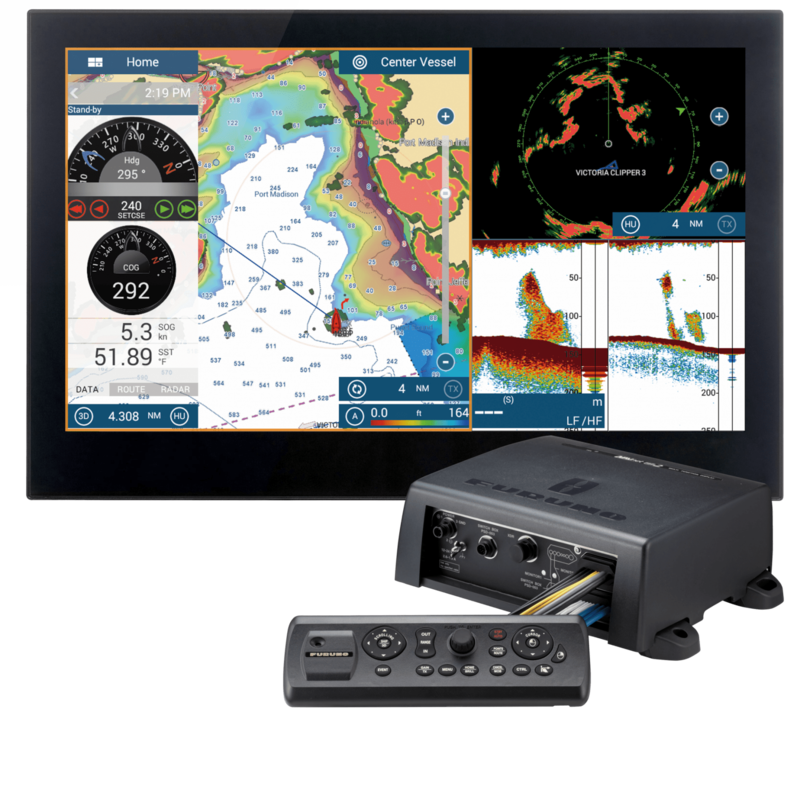 This next step in the NavNet series takes the feature set of the award-winning TZtouch2 and packs it into a brand-new black box configuration with dual-display capability. The TZT2BB packs enough processing power to drive two separate touch-screen displays, delivering twice the navigation potential from a single, compact black box unit, for the most technologically advanced all-glass bridge available. TZT2BB can drive two independent monitors such as Furuno’s 17″, 19″ or 24″ Multi Touch Displays, which allows you to seamlessly move from one screen to the other. It has the capability to handle different monitor resolutions and aspect ratios, which is convenient if you want to utilize existing monitors of different sizes. It also supports full HD video input in HDMI format, for surveillance cameras, sonar or entertainment systems. The TZT2BB operates with the same intuitive Multi Touch interface as the current TZtouch2 MFDs. You can add an optional external keyboard. Customers looking to upgrade from a NavNet 3D Black Box system will be happy to learn that the external TZT2BB keyboard is the same size as their existing keyboard, making it an easy swap, with no cutting. A retrofit kit will be available as an option to convert NavNet 3D’s MFDBB keyboard for use with the new TZT2BB. 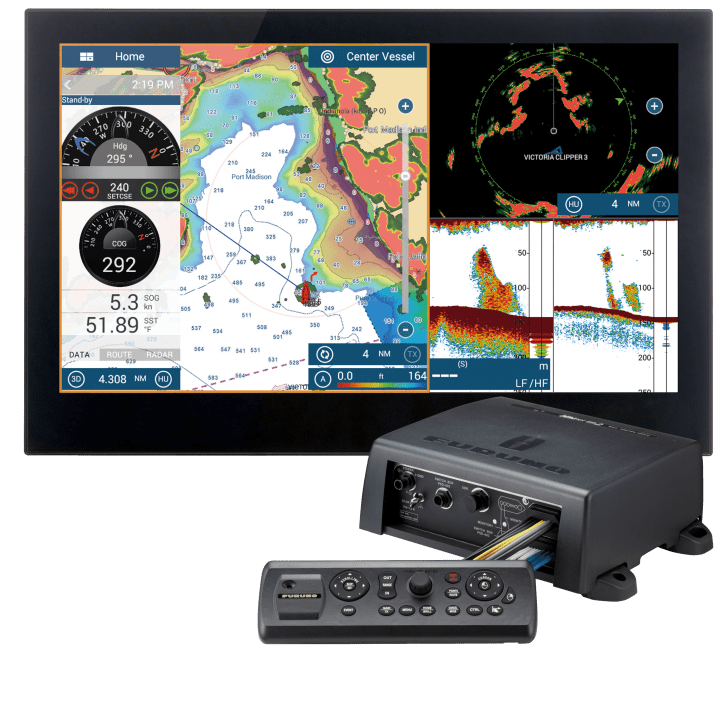 Similar to the 12.1″ and 15.6″ NavNet TZtouch2 models, the TZT2BB leverages Furuno’s award-winning network products, including a variety of NXT and X-Class radars, fishfinders, multi-beam sonar, instruments and other sensors. Radars are available ranging from a compact, 4kW Solid-State Doppler Dome to a super powerful 25kW Open Array. For fishfinders, the TZT2BB includes a built-in dual-frequency Furuno Fish Finder with RezBoost, which creates images 4 to 8 times sharper than a conventional fishfinder. In addition to the built-in Fish Finder, Furuno has impressive add-on options that include the DFF3D Multi-Beam Sonar and DFF1-UHD TruEcho CHIRP Fish Finder. You can both the internal fish finder and the DFF3D Multi-Beam Sonar simultaneously. The unit comes preloaded with raster, vector and fishing charts for the Western Hemisphere in MapMedia’s MM3D format. The U.S. NOAA raster and vector charts are free, while the preloaded Navionics and C-Map charts are available for purchase. Furuno also provides free satellite photography for the U.S. that can be downloaded from their website. As with the TZTL12F and TZTL15F models, tablets and smartphones can be accessed via built-in WiFi, with several free apps available on both Apple and Android platforms, allowing you to remotely view and control your navigation network. Furuno continues to break new ground with their latest Black Box, the TZT2BB. The TZT2BB is perfect for larger helms to display all navigation, radar, fishfinder and instrument sensors across dual displays. For more information on the NavNet TZT2BB, contact Furuno at (360) 834-9300 or visit them online at www.FurunoUSA.com.